Wolfgang Diefenbach has collaborated with well-known orchestras, international soloists and major jazz composers and arrangers, such as Bill Holman, Manny Albam, John Clayton, Bob Mintzer, Jerry van Rooyen, Bill Dobbins, Ray Brown, Bob Florence and Steve Gray, to name just a few. For three decades, talented upcoming young musicians and selected winners of the “Youths Play Jazz Contest” have been given the opportunity of constant professional development under Wolfgang Diefenbach’s professional direction, performing as members of the Hessen State Youth Jazz Orchestra (Kicks & Sticks). His successful teaching concept combines regular workshop sessions with well-known tutors, concerts and stage appearances at jazz festivals with famous soloists, and international tours. Top-class recordings and numerous TV and radio productions document Wolfgang Diefenbach’s diversity, his high standards and his selection of musical partners. He succeeded in winning star saxophonist and composer Bob Mintzer to write Pots & Pans exclusively for the band — a title that the orchestra has by now played all over the world. Pots & Pans can not only be found on the first CD Kicks and Sticks , with which Wolfgang Diefenbach and Kicks & Sticks won the German Record Critics’ Award, it is also on the CD Happy Birthday , featuring Bob Mintzer himself as soloist. 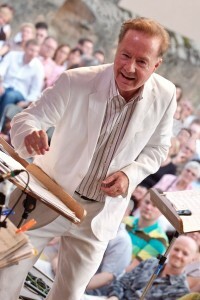 In addition to his intensive commitment to young jazz musicians, the experienced band-leader is also dedicated to directing jazz vocal ensembles, and most of all to his large-scale crossover concert projects, which he has performed in major concert halls in all continents and in nearly all European countries. With Crossover Xmas, he presented a broadly diversified crossover programme of high-class music with a 200-strong choir and international guest stars, including of course the Hessen Kicks & Sticks!